Mary Coffin Starbuck was born February 20, 1645 in Haverhill, Massachusetts, just two years after her parents’ arrival from Devonshire, England. 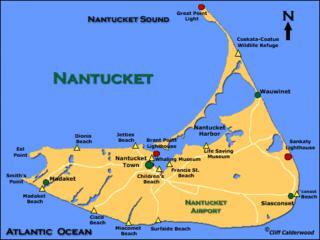 Ten men got together and planned the purchase Nantucket Island, off the Massachusetts shore. Mary’s father, Tristram Coffin was the leader of the group — along with Edward Starbuck, Thomas Macy, and Isaac Coleman – and the purchase took place in 1659. He took his family to the island in 1660, where he was Chief Magistrate in 1671 and Commissioner in 1675. A woman preaches before an assembly of Quakers in London in 1723. Little is known about Elizabeth Ashbridge beyond what is recorded in her brief autobiography, Some Account of the Fore Part of the Life of Elizabeth Ashbridge, first published in England 1774. The book is a frank account of her unhappy marriage and her search, with the help of various religious groups, for a sincere religious faith. It is remarkable both as the spiritual testament of an intelligent and courageous woman, and also as a revealing (and often unflattering) depiction of life in colonial America in the first half of the 18th century. Elizabeth Ashbridge was born in 1713 in the town of Middlewich in Cheshire, England to Thomas and Mary Sampson. Thomas was a surgeon on sea vessels, and Mary was a pious follower of the Church of England. When Elizabeth turned 14, she married a miserly stocking weaver several years her elder without parental consent, only to become a widow five months later. In the 17th century, the Quakers – also known as the Society of Friends – were a form of Protestant Christianity that was started by George Fox in England in 1652. According to tradition, Fox was standing on Pendle Hill in northwest England when he received a vision from God directing him that instead of simply obeying doctrines and rules, he should focus on the Inner Light—the ability of every person to directly receive God’s love. 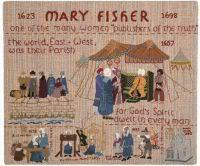 Mary Barrett was born in 1610 in London, England. In St. Martin-in-the-Fields, London, on October 27, 1633, Mary married William Dyer, a milliner and a Puritan. Mary and William emigrated from England to the Massachusetts Bay Colony in 1635. They settled in Boston, and on December 13, 1635, they were admitted to the Boston church. They were numbered among the intelligent citizens, being above the average in education and culture. William became a freeman of the Colony in 1636, and he held many positions of public importance. The Dyers became early supporters of Anne Marbury Hutchinson. 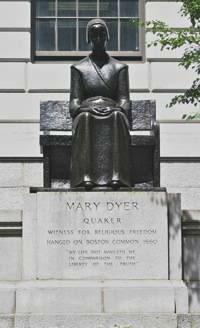 When Anne was excommunicated, Mary Dyer walked out of the church with her. When Hutchinson was banished from Massachusetts Bay Colony in 1638, the Dyers followed her to Rhode Island, a colony founded on the principle of religious freedom. They helped to found the new colony at Providence. Puritan leaders called Anne Hutchinson and her supporters Antinomians—individuals opposed to the rule of law. Puritans saw her as a challenge to their male-dominated society. Tried for sedition, she was also exiled as a danger to the colony. She lived in Rhode Island for a time and then moved to New Amsterdam, where she was killed in 1643 during a conflict between settlers and Native Americans. Anne Marbury was born in Alford England, in July 1591, the daughter of Francis Marbury, a deacon at Christ Church in Cambridge. Anne’s father believed that most of the ministers in the Church of England hadn’t received the proper training for their position, and he said so. He was promptly arrested and spent a year in jail for his subversive words of dissent. But he wasn’t deterred, and he was arrested several more times.